Hiring a barn builder can feel overwhelming, especially if you’re new to the process. Whether you’ve been dreaming about a specific barn your entire life or aren’t quite yet sure what type of structure you want, you’ll want to find the best barn builder to make your project successful from concept to completion. Look for these four golden qualities in a contractor. Many general contractors can draw up basic plans for a barn. But when you work with barn building specialists, you invest in the expertise that comes with designing these diverse structures. For example, a barn builder will guide you through important decisions, like which type of stall door is best for your horse barn or how to design a standalone garage with code-compliant living quarters. These insights ensure you get a barn that’s functional, and they help lower costs by reducing the need to alter a design mid-project or after completion. We collaborate closely with you to plan your dream structure. At Quarry View Construction, barn design is a collaborative process led by our in-house team. We start with a conversation to learn more about your needs, wants, and budget. We use computer-aided design to streamline planning. Our designers use 3D modeling software to produce realistic visuals that make it easy for you to refine the plans and understand what the finished project will look like. We can also share the 3D models using one-on-one web conferencing to work with you remotely during the design process—we’ve even collaborated on barn plans with clients vacationing out of the country. One-size-fits-all may not fit you one bit. Factors like building site, environmental sustainability, and your personal preferences may make a custom-designed barn a smarter investment than one built from stock plans or pre-fab components. A barn building specialist designs a barn just for you, whether you want to match existing buildings or incorporate a tricked-out tack room. Plus, let’s face it: if you’ve been dreaming about a new barn since you were a little tyke, you deserve a structure that makes your childhood vision a reality. We start with a basic 3D model. The initial model’s simplicity allows us to easily move or change features based on your input and our barn building experience. For example, the process allows us to easily widen a door to accommodate specific equipment or move window placement until we find the best spots to maximize natural light. We refine details until you have a barn that’s functional and meets your budget. The structure’s design continues to evolve until it reaches the final rendering, which provides a realistic, full-color depiction of how the barn will actually look on the property. 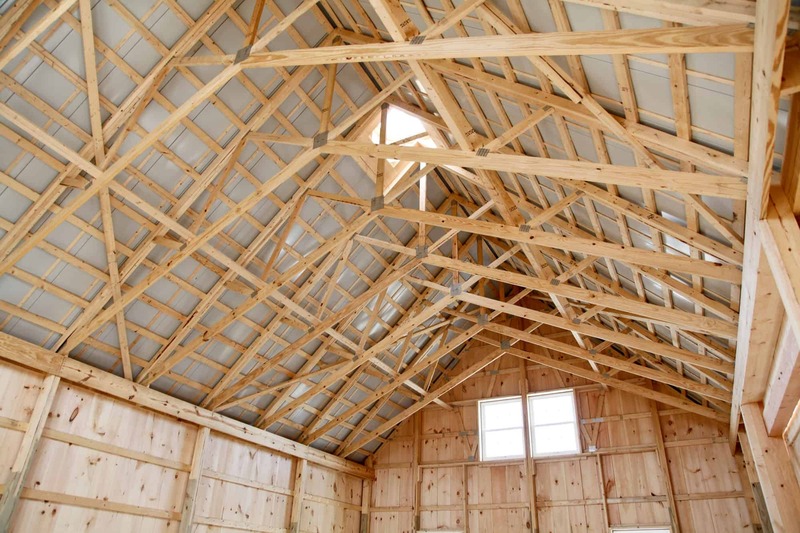 In many areas, general contractors offer little or no specific barn construction expertise. That doesn’t make them bad contractors, but it suggests they may not have the practical know-how to design and build your custom barn in an efficient, cost-effective way without sacrificing quality. A reputable, experienced barn builder brings proven skills, expertise, and resources to the project, particularly if the team incorporates generations-old Amish barn building techniques into its process. We combine technology, creativity, and old-world craftsmanship. The Lancaster, PA Amish community is world-renowned for its work ethic and craftsmanship. Clients often hire us because they expect our crews to build barns using that old-world attention to detail. And those clients are wowed when we exceed those expectations. Regular contractors may not have the experience to handle necessary permits for new barns. Professional barn builders are familiar with the permit process and will know how to submit needed documentation with minimal inconvenience to you. Our team will check in with your jurisdiction to ensure the structure’s plans are compliant with current local regulations. We ensure the project meets all requirements and codes. From submitting paperwork to, when necessary, acquiring an architect’s seal, Quarry View Construction will navigate the permit maze, so you don’t need to. Whether you’ve been dreaming of a horse barn, workshop, or stylish structure to house classic cars, you’re more likely to get the building and construction experience you deserve by collaborating with a barn building expert. Get in touch for a free, no-hassle consultation.